The following update was prepared by the 18 teachers that were enrolled in two graduate education courses at Heidelberg University geared towards utilizing the Johnson’s Island Civil War Prison archaeological study for middle school and high school use. They were asked just to present some aspect of the experience for the AIA readers. I hope that this gives you some idea of how enriching the experience has been for these education professionals. 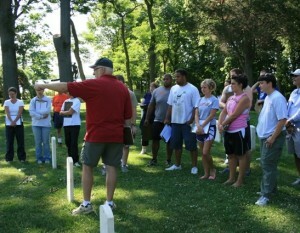 When we first arrived on Johnson’s Island, the class met at the Confederate Cemetery for an observational activity. After being divided into three groups, we were assigned to look through the cemetery and find patterns of human behavior, looking at the tombstones, observing structure and design. Then we had to come up with hypotheses to explain the patterns. This activity stimulated our observational skills, as well as the importance patterns can play in the research process. Along with looking for patterns and hypothesizing, we had the opportunity to hear the voices of the prisoners buried in the cemetery via primary documents of diaries and letters, introducing us to the men and the culture we would be learning more about as the week progressed. We chose to write about Dig Bingo, not only because we were the only ones to get bingo thus far (and we thought we never would), but because it is something that can be used for a great tool in the classroom! When we were first given our bingo sheet we assumed it was just the activity for the day and it would be no big deal, little did we know it wasn’t as easy as it looked! As we began digging and sifting as a team we soon realized how difficult it was going to be. Being a young competitive group we quickly learned the techniques to finding artifacts in the dirt. We were able to find pieces of chamber pots, possible tea cups, animal claws, parts of medical and relish bottles, and pottery to get our bingo. 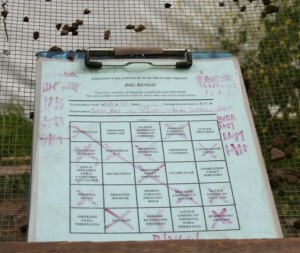 Getting bingo after three days of digging was one of the most exciting things about the week. Bingo was not only a fun, competitive game but it also made us slow down and pay attention to detail. Being patient and carefully sorting through our dirt was very important. We were forced to slow down and categorize each of the objects we found and why they would be classified as they were. It was a good experience for the group and we all feel it was effective in making us be diligent young archaeologists! Games like Dig Bingo can be used with people of all age, from young school age children to older adults. It is a game that motivates students to pay attention to detail. Dig Bingo is an activity that motivated us to find cultural artifacts and focused our minds determining the artifacts’ original functions. We had a lot of fun and got more out of digging than I thought we would! We learned to work as a group to keep our unit level, learned new vocabulary, learned the very elaborate process of digging and also the excitement in finding something as small as a piece of glass that can tell stories of the past! Throughout the excavation process it is important to keep a level surface within the unit. This ensures that features within the subsoil can be identified. Features are intrusions in the soil that can give clues to our findings. By maintaining a leveled surface, artifacts and features can more effectively identified and recorded. To ensure a level unit there is a simple process to follow. The excavator begins by turning on the Robo Laser which projects a red laser beam. 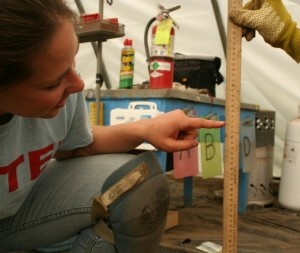 This projected beam is level, and by holding a meter stick perpendicular to the ground we can measure the depth reached. As the excavator continues scrapping with the trowel, the centimeters increase. 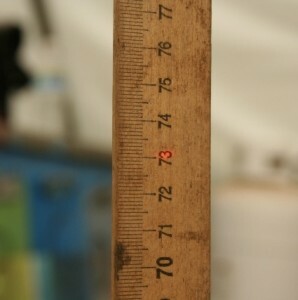 Numerous and frequent measurements are necessary to maintain a uniform depth. It allows the excavator to determine which areas need further excavating. The highlighted artifacts group B found included: a spittoon fragment, a bed pan fragment, a chamber pot, and two pieces of a hard rubber ring with silver engraved inlays. Additionally, we found large quantities of brick, flint, window glass, animal bone, and metal nails. We were able to use the level technology to record what depth the artifacts were found. 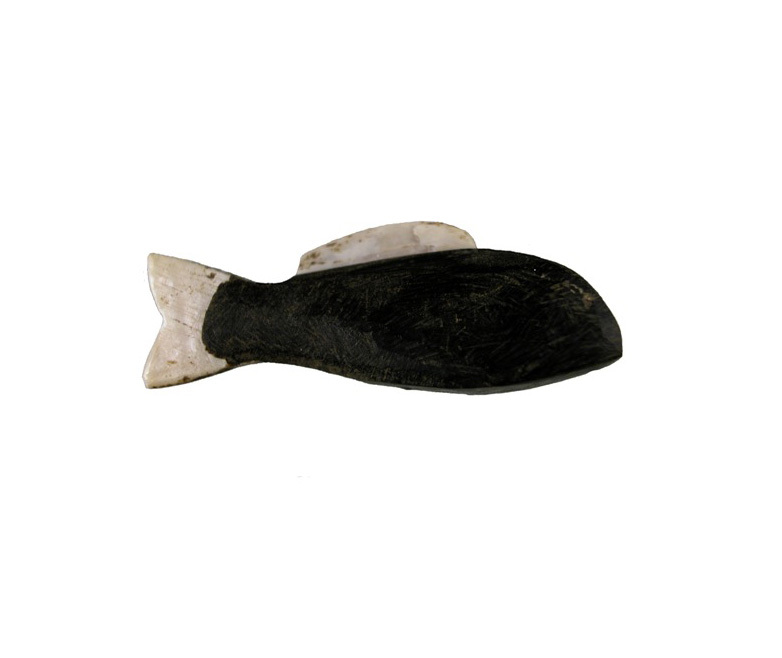 I read the comments and wanted to add the picture of the hard rubber fish that Dave Fadley discovered years ago during his first experience at Johnson’s Island. We are currently using this image as part of our new t-shirt for the site. We are very proud of the Experiential Learning Program which has been developed by myself and Dr. Marcia George with the help of our able field assistants like Dave Fadley and many teachers and volunteers making wonderful suggestions. As Dave stated so well, it is not like going to work. 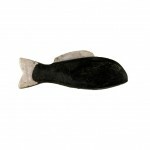 Hard Rubber Fish made from hard rubber and shell. This entry was posted on Monday, July 20, 2009 at 7:59 am	and is filed under Archaeology for Educators, Field Reports. You can follow any responses to this entry through the RSS 2.0 feed. Both comments and pings are currently closed. Thank you everyone for allowing me to be a part of your experience! I have so many ideas running around my head for next year’s experience with my class. I really appreciate all of your ideas, help, and encouragement. My time with you is definitely a highlight of my summer. Thanks for sharing the field reports – I will be sharing them with my students. We always enjoy having interested educators at the site. The more knowledgeable, excited, and inquisitive our teachers are about the experiential program/site the more their students respond in the same manner. We welcome visitors of all ages and are more than happy to assist anyone in exploring the unique opportunities for learning that this site has to offer. Good luck with your students, Sue! Reading these Field Reports [I love their format] reminds me of my Teacher Workshop experience in 1997. I was fortunate to have found the little hard rubber fish that is on the Bingo Items Board. Having now worked with the Experiential Learning Program for 6 years, I still get excited about coming to JI to work [even though I don’t call it that, even on the worst of days]. 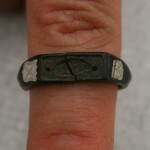 It still amuses me when a student finds a nail or piece of broken ceramic. They also think it’s a neat way to get out of their classroom for a day [but are they, really?] Where esle can you get dirty without being yelled at and also maybe find an FS and take home that coveted yellow star? Keep up the good work, Dr. Bush and students!! I am 66yrs old and would like to volunteer for a dig next summer, if possible. I also have a 62yr old frend who would like to volunteer. We both live in the Upper Peninsula of Michigan. How can I volunteer for a dig? Lee, We would love to have you participate in the excavations next spring and summer. All you need to do is get onto the web site http://www.johnsonsisland.com and go to the volunteering section. Send me an email with your contact information and I will put you on the list. Hope to see you next year. I lived in the city of Sandusky for thirty three years and visited the island quite often. I never knew all of the things that were there. Thank you for the insight. Keep up the good work that you have done. I was fairly pleased to unearth this web page. I wanted to thank you for this superb read! I positively enjoyed every single little bit of it, and I have you bookmarked to check out new stuff you write-up. How can anone volunteer for a dig?